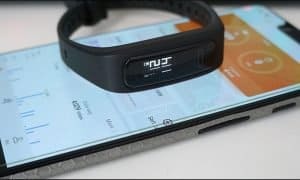 As we acquire more and more portable devices, we’re more likely to find ourselves in a situation where we need a little bit of extra juice for our smartphones, tablets, or other devices. External battery packs range in price and capacity, and we’re taking a look at a whopper of a battery pack in our RAVPower 20100 mAh External Battery review. The RAVPower 20100 mAh External Battery is pretty simply designed and is roughly the size of a Nexus 6P smartphone and just under 3/4″ thick. The top features the RAVPower logo, and in the lower left hand side a button you can press to light up the four LED indicator lights that let you know how much battery you have left. 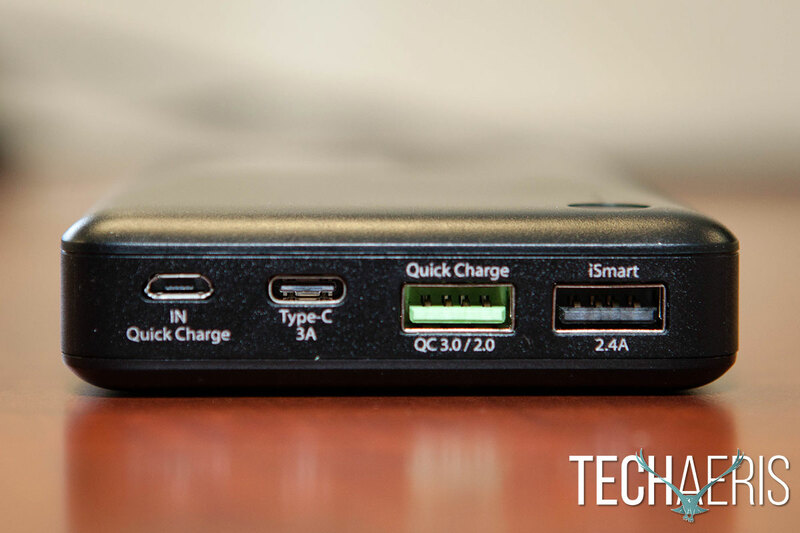 The left side of the external battery includes the microUSB Quick Charge in, Type-C (3A), Quick Charge (QC 3.0/2.0), and iSmart (2.4A) ports. 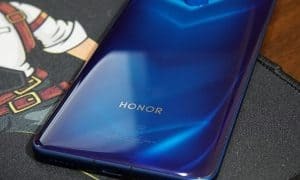 The company includes two microUSB to USB cables — a shorter 8″ cable and a longer 2′ cable, but no USB-C cable. A mesh carrying case is also included for transporting and keeping your external battery pack safe from bumps and scratches. 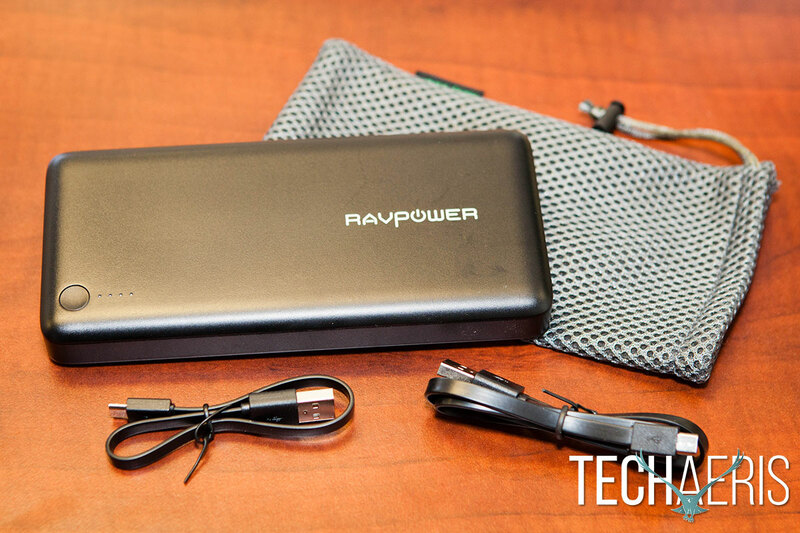 The RAVPower 20100 mAh External Battery pack includes 2 microUSB cables and a carrying pouch. The RAVPower external battery pack also includes safe circuit protection and will automatically shut down if a short circuit or overload occurs, preventing damage to your attached devices. As with most external battery packs, the RAVPower 20100 mAh External Battery is dead simple to use. Simply charge it to capacity, then plug in your smartphone, tablet, or other microUSB or USB-C device to recharge it. In our testing, we saw rapid charging from all output ports and devices charged quickly as expected. When connected to a QC 3.o wall adapter, the RAVPower recharged in roughly 4 and a half hours — which isn’t bad considering its huge 20100 mAh capacity. With a 20100 mAh capacity, this RAVPower external battery will last you through plenty of charges depending on what you’re charging. I was able to charge three different phones and two tablets on a single charge, and the battery pack also seems to hold the charge quite well when unused. Charge your devices using USB-C or USB to microUSB. 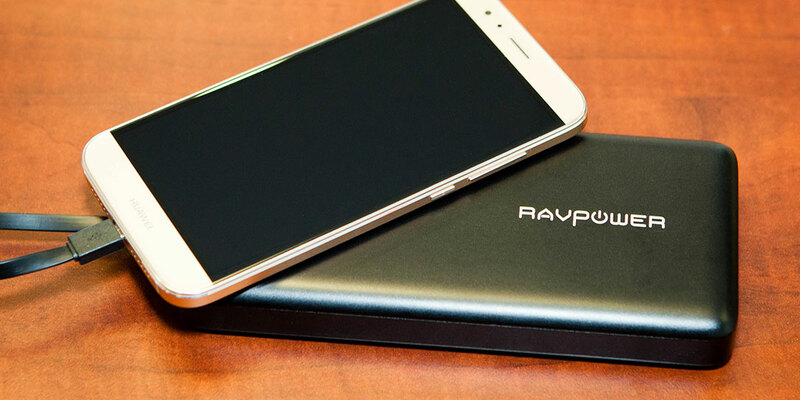 Currently priced at $69.99USD ($79.99CAD), the RAVPower 20100 mAh External Battery pack is reasonably priced considering the capacity and the fact you get Quick Charge and rapid charging support. If you’re looking for an external battery pack with Quick Charge/rapid charging support and large capacity, you can’t go wrong with the RAVPower 20100 mAh External Battery pack. 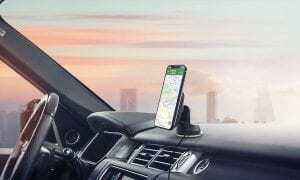 Simple design, outstanding battery capacity, supports Quick Charging and rapid charging of devices as well as Quick Charging to recharge the external battery pack itself. Inclusion of two microUSB cables is nice, but would have been better to include one microUSB and one USB-C cable. If you're looking for an external battery pack with Quick Charge/rapid charging support and large capacity, you can't go wrong with the RAVPower 20100 mAh External Battery pack. *We were sent a review sample of the RAVPower 20100 mAh External Battery for the purposes of this review.